Do you see a sign on this banner that says 'Dead Ogre Storage'? Here's the latest model I've finished for the Bull Ogre Kingdoms army. He'll be a unit standard, likely in the Iron Guts. He's about what you'd expect, if you know the rest of the army. Don't ask why I love to make other types of models look like Empire models. It must be the German side of my family coming out. His right elbow, forearm, and wrist are all custom sculpted. The hand is from the plastic Mino kit. The banner pole is a piece of wooden rod. As with the rest of my Minotaurs, I converted him to give him a proper neck. It just looks weird to me when a head juts right out of the front of a chest. That has the added benefit of making him a bit taller. His left hand and weapon are from the plastic minotaur kit. 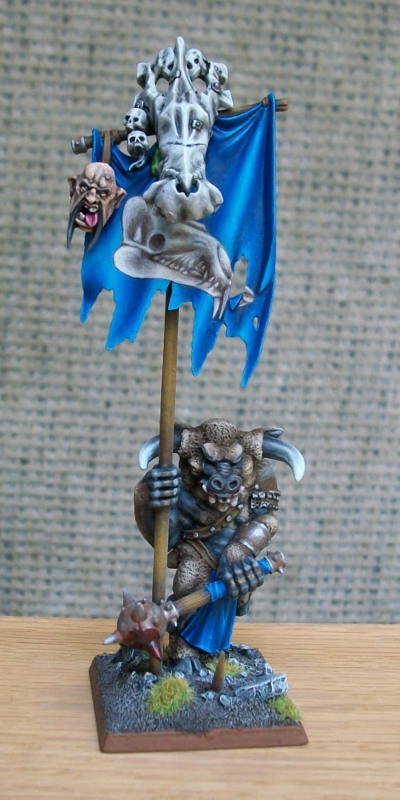 The banner trophy skull is from the Mournfang Cavalry plastic box set. Here's a size comparison with an unconverted Ogre Iron Gut (courtesy of The Bear), so you can get an idea of how tall he is. This guy was a lot of fun to do up, and even to paint. I very much enjoy converting stuff like this. I am woefully sick of painting banners though! They take me almost twice as long as it takes to paint the main model. Meh. 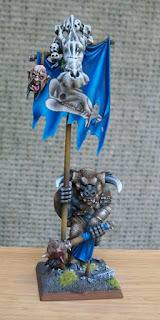 Very sweet standard bearer. You sir, are a convertaholic.